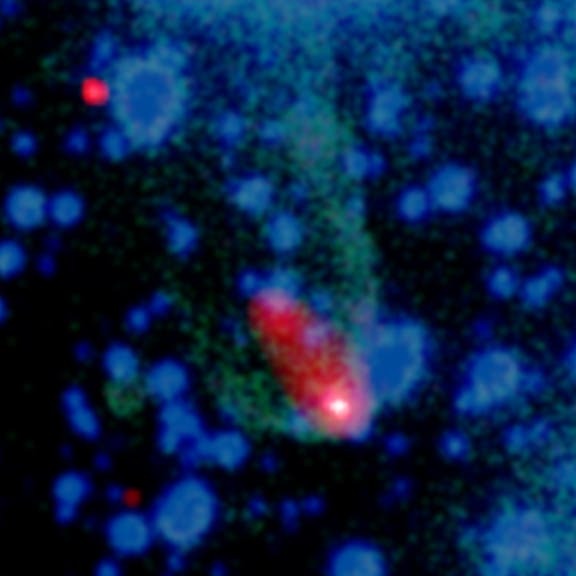 The discovery was made at the University of Texas at Brownsville, where Frederick Jenet and colleagues monitored a pulsar more than 10,000 light years away. As pulsars spin, they emit a rotating beam of radiation that flashes past distant observers at regular intervals like a lighthouse beacon. Jenet's group thinks that anomalous dispersion should be added to this list. Using the Arecibo Observatory in Puerto Rico, they took radio data of the pulsar PSR B1937+21 at 1420.4 MHz with a 1.5 MHz bandwidth for three days. Oddly, those pulses close to the center value arrived earlier than would be expected given the pulsar's normal timing, therefore appearing to have traveled faster than the speed of light. The cause of the anomalous dispersion for these pulses, according to the Brownsville astrophysicists, is the resonance of neutral hydrogen, which lies at 1420.4 MHz. But like anomalous dispersion seen in the lab, the pulsar's superluminal pulses do not violate causality or relativity because, technically, no information is carried in the pulse. Elsewhere, a brilliant young Spanish physicist, João Magueijo, has been pondering the heretical question: What if the speed of light—now accepted as one of the unchanging foundations of modern physics—were not constant? Magueijo, a 41-year old native of Portugal, puts forth the heretical idea that in the very early days of the universe light traveled faster—an idea that if proven could dethrone Einstein and forever change our understanding of the universe. He is a pioneer of the varying speed of light (VSL) theory of cosmology -an alternative to the more mainstream theory of cosmic inflation- which proposes that the speed of light in the early universe was of 60 orders of magnitude faster than its present value. Solving the most intractable problems of cosmology in one brilliant leap, Magueijo’s varying-speed-of-light theory (VSL) would have stunning implications for space travel, black holes, time dilation, and string theory—and could help uncover the grand unified theory that ultimately eluded Einstein. Joao Magueijo's radical ideas intend to turn that Einsteinian dogma on its head. Marueijo is trying to pick apart one of Einstein’s most impenetrable tenets, the constancy of the speed of light. This idea of a constant speed (about 3×106 meters/second) -is known as the universal speed limit. Nothing can, has, or ever will travel faster than light. Magueijo -who received his doctorate from Cambridge, has been a faculty member at Princeton and Cambridge, and is currently a professor at Imperial College, London- says: not so. His VSL theory presupposes a speed of light that can be energy or time-space dependent. In his fist book, Faster than the Speed of Light, Magueijo leads laymen readers into the abstract realm of theoretical physics, based on several well known, as well as obscure, thinkers. The VSL model was first proposed by John Moffat, a Canadian scientist, in 1992. Magueijo carefully builds the foundations for a discussion of Big Bang cosmology, and then segues into the second half of the book, which is devoted to VSL theory. Like most radical, potentially seminal thinkers, Magueijo shakes the foundations of the physics community, while irritating off many of his fellow scientists. VSL purposes to solve the problems at which all cosmologists are forever scratching: those inscrutable conceptual puzzles that surround the Big Bang. Currently many of these problems have no widely accepted solutions. Could Einstein be wrong and Magueijo right? Is he a gadfly or a true, seminal genius? Time will tell.